There are a several ways to create a grid of plots; in this example we use the strip_chart command to create three vertically-aligned plots which have a "shared" or "common" X axis (so that changes to the scaling or limits of one X axis is automatically reflected in all three plots). It also highlights some of the different ways to control the appearance of axes; in particular how to select the arrangement of major and minor tick marks. 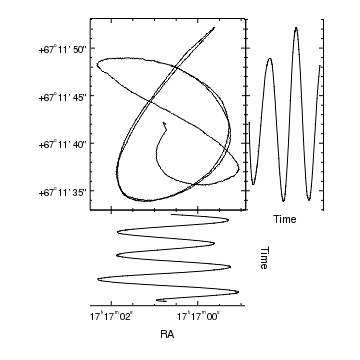 The data to be plotted is from the aspect solution of a Chandra observation; we wish to show how the RA, Dec, and Roll of the telescope varied with time. Before we create the plot we change several ChIPS preferences: curves are only displayed as lines, plots are drawn using the "open" style - which means that only the bottom and left edges of the plot contain an axis, the plot margins are changd to better make use of the space in the frame given the data being plotted, and the offsets for the axis labels are increased. The set_preferences call applies these settings. 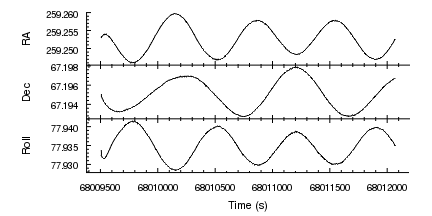 The top plot, which is current, is used to display the RA versus time data. The tick marks for both axes in this plot are adjusted using the set_xaxis and set_yaxis calls; of note is the change in the majortick.interval setting which determines the spacing of the major tick marks. 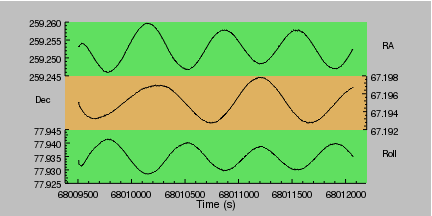 The second plot is used to display the variation of the telescope Declination with time and the third plot the roll variation. In all plots similar adjustments are made to tweak the axes. Here we plot the same data as the initial example, this time with a small vertical gap between the plot created by setting the optional third argument of strip_chart to 0.05 (the default is 0). In both this visualization and the previous example, the preferences for the plot margins were changed before strip_chart was called. This is because the margin preferences are used to layout the plots, including calls used to adjust the spacing between the plots or their relative sizes, not the values used by the current plot. Here we take the arrangement from the first example and hide the X axes of the top two plots to make it appear as if there is a single plot with three different Y axes. # Add a label where the Y axis used to be. # to act as a background. In the middle plot we want to hide both the X and Y axes and display a Y axis on the right-hand side. This can be done by moving the Y axis (called "ay1") to the right-side of the plot using move_axis. As the axis was created before any data was added to the plot, it was placed using the plot-normalized coordinate system, so the coordinates used to move the axis should also be in this system: here we move the axis to x=1 which corresponds to the right-side of the plot (x=0 is the left side of the plot area). The set_yaxis call recognizes that setting majortick.count means that the majortick.mode setting should also be changed to count. The split command is useful when you want to create a grid of plots (i.e. with multiple rows and columns). In this example we use it to create a 2 by 2 arrangement of plots; this is then modified by deleting the last plot and adjusting the relative widths and heights so that the first plot is twice as big as the other two plots. The main plot is used to show the Right Ascension and Declination of the telescope varied together (the data used is a small subset of the Chandra observation and so does not show the full Lissajous curve you would expect to see). 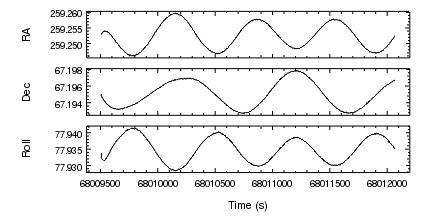 The secondary plots are used to show the temporal variation of the two axes; even though the time axes in these plots have been hidden for display purposes, you can still display data using these axes. # this changes the display of both plots. For full control over the grid - including support for varying number of rows or columns, use one of the the grid_objects, col_grid_objects, or row_grid_objects routines.